The Kosovo President, Atifete Jahjaga, ends her mandate in early April, but who is going to succeed her? In fact, the only candidate who openly stated his claim to become President in 2016 is the leader of the Democratic Party of Kosovo (PDK), Hashim Thaçi, who currently holds the position of Deputy Prime Minister and Minister of Foreign Affairs. Thaçi expects to become head of state under the terms of the coalition deal signed in December 2014 between his party and its former fierce opponent - the Democratic League of Kosovo (LDK). The coalition between the two hostile parties ended a six months long damaging political deadlock, giving the LDK leader, Isa Mustafa, the position of Prime Minister, while Thaçi would become President in 2016 when Jahjaga's term ends. The Kosovo President is elected by the parliament in secret ballot by a two thirds majority of all deputies of the Assembly. If a two thirds (2/3) majority is not reached by any candidate in the first two ballots, a third ballot takes place and the candidate who receives a simple majority in the Assembly is elected. The vote in the Assembly should take place in early March at the latest, or no later than a month before the end of the current President’s term of office. A political analyst, Imer Mushkolaj, told OBC that despite the deal between the coalition partners, Hashim Thaçi cannot be sure that he would be elected as President. “Perhaps there will be attempts to modify the deal, so that Thaçi returns in the position of Prime Minister, while Isa Mustafa would try to become President. It is a process with many dilemmas and not easy at all,” Mushkolaj noted. According to him the issue of the President is associated with the establishment of the Special Court which will judge the Kosovo Liberation Army’s alleged war crimes. “If in the list of potential people who could be tried by the Special Court there’s also the name of Hashim Thaçi (the former KLA leader) we could face a new situation,” warns Mushkolaj. In addition, Thaçi’s election as President could be challenged also by some members of the coalition parties. Not all of LDK deputies are willing to vote him into this position, while also the other coalition partner, the Serbian List (Srpska Lista), may condition the vote with the establishment of the Association of Serb Majority Municipalities, which is fiercely opposed by the opposition parties. If the electoral process for President will be blocked due to these circumstances, it is likely that the current President of Kosovo, Atifete Jahjaga, may be re-elected, although so far she did not express any interest to run for the second term. Jahjaga doesn’t have political support for re-election but the international diplomats in Kosovo back her. She is the first female President of Kosovo, the youngest female head of state and the first non-partisan candidate to be elected in this position. Five years ago, following a political crisis which left Kosovo without a President, the then US ambassador to Kosovo Christopher Dell reached an agreement with main political leaders to nominate Jahjaga as the consensual candidate. At that time she was a police commander, but most Kosovars hadn’t heard of her. Throughout her five years term Jahjaga managed to present Kosovo in the international arena better than previous Presidents. Hence she enjoys unprecedented international support and in 2014 received the award for Leadership in Public Service from the Clinton Global Initiative in New York. In April she is ending her term without any scandal, or accusations of corruption practices or nepotism. Despite this, her leadership in Kosovo was wan and unrepresentative, so she was highly criticized. A few days ago, Jahjaga’s portrait was painted on a wall, showing her in a rather awkward outfit and wearing a police cap. 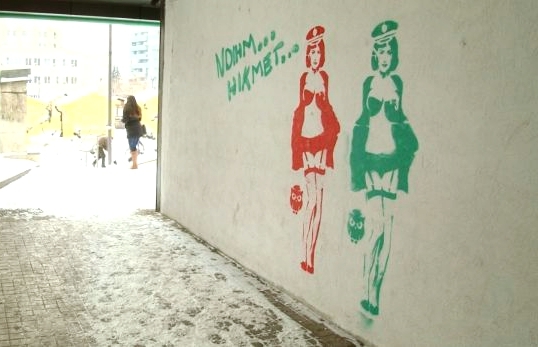 This graffiti provoked a storm of reactions within institutions, women’s organizations and social media, who estimated that this is a sexist graffiti and as such exceeds freedom of expression. Other graffiti portraying men politicians remained under the shadow of Jahjaga’s one. Another political commentator, Besa Luzha, says that the way the President was elected – being an unknown figure with no political background - followed her all the time. “She tried to represent the unity of the people of Kosovo, but she didn’t succeed. Her performance as a leader left much to be desired. But at least internationally she represented Kosovo’s image much better than her predecessors. I don’t think that she was prejudged due to gender, but due to a very weak performance beside the support she received from internationals,” added Luzha. According to her, neither Hashim Thaçi nor Atifete Jahjaga are the best candidates to present the unity of the people. “I think Kosovo has many good candidates who could be nominated. I think that the President should be elected directly. He or she should be a brave, capable and distinguished candidate, who would make us all feel proud,” concluded Besa Luzha. But the other political analyst, Imer Mushkolaj, has a different opinion. He says that Kosovo would not be damaged should President Jahjaga decide to run for the second term. “Despite the lack of political support, she has shown a solid performance during her mandate. Criticized, attacked and often underestimated, yet she managed to meet her constitutional obligations,” pointed out Mushkolaj. Until now opposition parties didn’t express their interest to nominate a candidate for the presidency. They are struggling vigorously to prevent establishing the Association of Serb Majority Municipalities which will have wide-ranging power over local economy, health, education, urban and rural planning, and the demarcation agreement between Kosovo and Montenegro, claiming that if implemented, Kosovo would lose part of its territory. The political situation between the ruling coalition and the opposition block has escalated so much, that lately some media reported that an international negotiator could come to Kosovo to mediate the dialogue between parties and to unlock the political processes.